My Elephant Project came about in the late fall of 2012. Late fall of 2012, I heard a story on NPR where a few of the poachers in Tanzania were interviewed. The story shook me to the core. It shed light on the severity of the poaching in Africa. Over 35,000 Elephants were slain brutally, (entire families with babies and pregnant females) for their ivory last year alone in Africa. Estimates are that if this continues at this rate, they could be extinct in 10-12 years. That HORRIFIES me and I feel the need to do SOMETHING. I don't understand how we humans can allow such a thing. I truly had the feeling that I didn't want to live in a world where this could happen to these magnificent beings, and just couldn't shake the devastating feeling in my gut. The next day I was in a meditation and saw elephant paintings. I started painting immediately and then contacted The Elephant Listening Project out of Cornell University who kindly gave me permission to use their amazing photos, and now am also supporting the Global Sanctuary for Elephants, The David Sheldrick Wildlife Trust, and Wildlife SOS. Since the cost of ivory has skyrocketed, organized crime and terrorist groups are using it to quickly get money. Since 2012, I have committed to doing all I can to help save and protect these magnificent beings that are threatened due to poaching and lack of awareness. A substantial portion of the proceeds of the paintings and prints will be shared with the different elephant organizations that I work with. The more I paint them, the more I fall in love. May all elephants and other animals everywhere be happy, safe, honored and protected. SAVE the Elephants. Please don't buy OR sell ANY ivory. For information on how you can help to save the elephants, please feel free to contact me. Artwork available for sale now in my Elephant Gallery (see Galleries). "Liora's passion and commitment to the welfare of elephants was clear from the start, in her piece called 'Lali', which she shared with me years ago. Since then Liora has thrown herself into the effort to save Africa's elephants, painting beautifully evocative images of both forest and savannah elephants, and generously passing along a good share of her income to support the Elephant Listening Project. Her advocacy and her financial contributions have made an important difference in our ongoing work in Central Africa." Thank you to The David Sheldrick Wildlife Trust, who I am now also supporting through painting their orphans. A minimum of 30% of the retail, at least 50% of net profits will support their Orphan Project and anti poaching teams (of paintings and prints of their elephants and rhinos). Check out my elephant gallery for the latest painting and prints available. 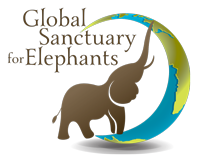 A big thank you also to Wildlife SOS, and The Global Sanctuary for Elephants for giving me the opportunity to help them through my artwork.